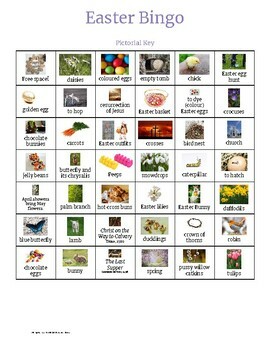 Enjoy this set of twelve 5x5 bingo boards made with 42 different labeled photos of Easter-related plants, animals, foods, and cultural and religious traditions. Also included are pictorial and word keys. One bingo board fills one page, so there is minimal prep after printing. All ages will enjoy the bright images. 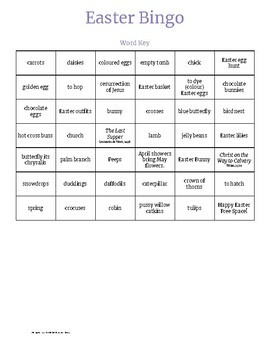 Bonus: I've included one 3x3 blank Easter bingo board with a free space in the middle to give you the option of having your students fill in the spring or Easter vocabulary specific to your class. 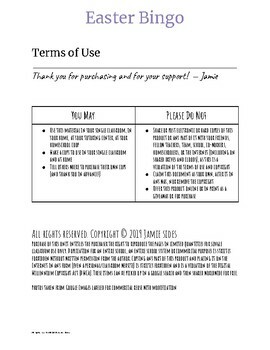 If you prefer to have each child make a randomized board using your class's vocabulary or spelling lists, the blank board page can be printed for as many students as you have. 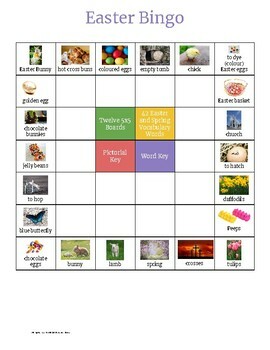 To see the entire list of vocabulary words and photos included on these bingo boards, download my free ESL/TEFL Easter Vocabulary product!